Note: The Firewall configuration settings can also be modified in the 'Advanced View' of the Home screen by clicking the status link beside Firewall in the Firewall pane. Block All: The firewall blocks all traffic in and out of your computer regardless of any user-defined configuration and rules. The firewall does not attempt to learn the behavior of any application and does not automatically create traffic rules for any applications. Choosing this option effectively prevents your computer from accessing any networks, including the Internet. Custom Ruleset Mode: The firewall applies ONLY the custom security configurations and Firewall rules specified by the user. New users may want to think of this as the 'Do Not Learn' setting because the firewall does not attempt to learn the behavior of any applications. Nor does it automatically create network traffic rules for those applications. You will receive alerts every time there is a connection attempt by an application - even for applications on the Comodo Safe list (unless, of course, you have specified rules and policies that instruct the firewall to trust the application's connection attempt). If any application tries to make a connection to the outside, the firewall audits all the loaded components and checks each against the list of components already allowed or blocked. If a component is found to be blocked, the entire application is denied Internet access and an alert is generated. This setting is advised for experienced firewall users that wish to maximize the visibility and control over traffic in and out of their computer. Safe Mode (Default): While filtering network traffic, the firewall automatically creates rules that allow all traffic for the components of applications certified as 'Safe' by Comodo, if the checkbox Create rules for safe applications is selected. For non-certified new applications, you will receive an alert whenever that application attempts to access the network. Should you choose, you can grant that application Internet access by choosing 'Treat this application as a Trusted Application' at the alert. This deploys the predefined firewall ruleset 'Trusted Application' onto the application. 'Safe Mode' is the recommended setting for most users - combining the highest levels of security with an easy-to-manage number of connection alerts. Training Mode : The firewall monitors network traffic and create automatic allow rules for all new applications until the security level is adjusted. You will not receive any alerts in 'Training Mode' mode. If you choose the 'Training Mode' setting, we advise that you are 100% sure that all applications installed on your computer are assigned the correct network access rights. If you choose not to show alerts then you have a choice of default responses that CIS should automatically take – either 'Block Requests' or 'Allow Requests'. You can select the type of new network you are connected to, so that the firewall configuration is optimized for the type of connection. Comodo recommends users to leave this option at its default, enabled setting (Default = Enabled). Enable Trustconnect alerts - If you are connecting to Internet at a public place like an airport or a coffee shop then you are potentially exposing yourself to danger. 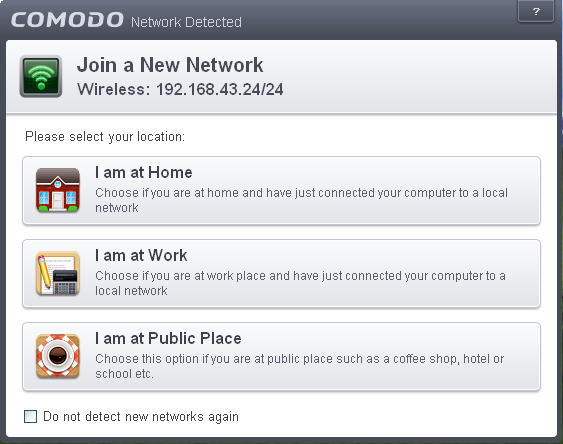 Unsecured public networks can allow other people to easily eavesdrop on your communications or even gain access to your computer to steal your confidential information.In order to safeguard against such attempts, Comodo recommends you encrypt your connection in public hotspots using TrustConnect - a secure Internet proxy service. 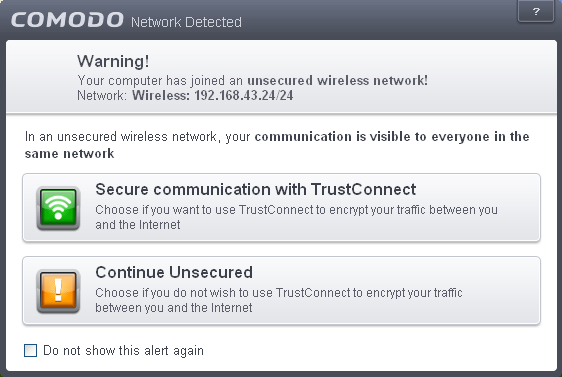 Unsecured Wireless Networks Only (Default) - TrustConnect alerts are displayed only if you are connecting to an unencrypted wireless network. Turn traffic animation effects on - By default, the Comodo Internet Security's 'Shield' tray icon displays a small animation whenever traffic moves to or from your computer. If the traffic is outbound, you can see green arrows moving upwards on the right hand side of the shield. Similarly, for inbound traffic you can see yellow arrows moving down the left hand side. This provides a very useful indicator of the real-time movement of data in and out of your computer. Clear this check box If you would rather not see this animation (Default = Enabled). By default, CIS does not automatically create 'allow' rules for safe applications. This helps saving the resource usage, simplifies the rules interface by reducing the number of 'Allowed' rules in it, reduces the number of pop-up alerts and is beneficial to beginners who find difficulties in setting up the rules. Enabling this checkbox instructs CIS to begin learning the behavior of safe applications so that it can automatically generate the 'Allow' rules. These rules are listed in the Application Rules interface. The Advanced users can edit/modify the rules as they wish (Default = Disabled). Background Note: Prior to version 4.x, CIS would automatically add an allow rule for 'safe' files to the rules interface. This allowed advanced users to have granular control over rules but could also lead to a cluttered rules interface. The constant addition of these 'allow' rules and the corresponding requirement to learn the behavior of applications that are already considered 'safe' also took a toll on system resources. In version 4.x and above, 'allow' rules for applications considered 'safe' are not automatically created - simplifying the rules interface and cutting resource overhead with no loss in security. Advanced users can re-enable this setting if they require the ability to edit rules for safe applications (or, informally, if they preferred the way rules were created in CIS version 3.x). Very High: The firewall shows separate alerts for outgoing and incoming connection requests for both TCP and UDP protocols on specific ports and for specific IP addresses, for an application. This setting provides the highest degree of visibility to inbound and outbound connection attempts but leads to a proliferation of firewall alerts. For example, using a browser to connect to your Internet home-page may generate as many as 5 separate alerts for an outgoing TCP connection alone. High: The firewall shows separate alerts for outgoing and incoming connection requests for both TCP and UDP protocols on specific ports for an application. Medium: The firewall shows alerts for outgoing and incoming connection requests for both TCP and UDP protocols for an application. Low: The firewall shows alerts for outgoing and incoming connection requests for an application. This is the setting recommended by Comodo and is suitable for the majority of users. Very Low: The firewall shows only one alert for an application. The Alert Frequency settings refer only to connection attempts by applications or from IP addresses that you have not (yet) decided to trust. For example, you could specify a very high alert frequency level, but not receive any alerts at all if you have chosen to trust the application that is making the connection attempt. Set new on-screen alert time out to: Determines how long the Firewall shows an alert for without any user intervention. By default, the timeout is set at 120 seconds. You may adjust this setting to your own preference. 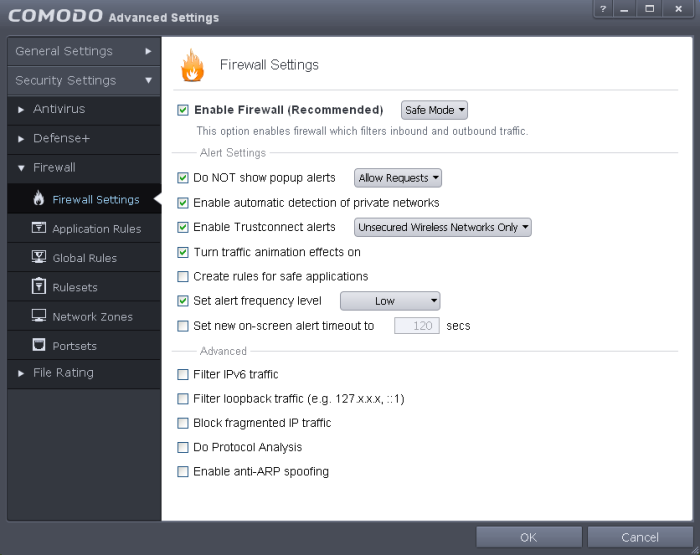 Comodo Firewall features advanced detection settings to help protect your computer against common types of denial of service (DoS) attack. When launching a denial of service or 'flood' attack, an attacker bombards a target machine with so many connection requests that your computer is unable to accept legitimate connections, effectively shutting down your web, email, FTP or VPN server. Background Note: IPv6 stands for Internet Protocol Version 6 and is intended to replace Internet Protocol Version 4 (IPv4). The move is primarily driven by the anticipated exhaustion of available IP addresses. IPv4 was developed in 1981 and is still the most widely deployed version - accounting for almost all of today's Internet traffic. However, because IPv4 uses 32 bits for IP addresses, there is a physical upper limit of around 4.3 billion possible IP addresses - a figure widely viewed as inadequate to cope with the further expansion of the Internet. In simple terms, the number of devices requiring IP addresses is in danger of exceeding the number of IP addresses that are available. This hard limit has already led to the development of 'work-around' solutions such as Network Address Translation (NAT), which enable multiple hosts on private networks to access the Internet using a single IP address. Filter loopback traffic: Loopback connections refer to the internal communications within your PC. Any data transmitted by your computer through a loopback connection is immediately also received by it. This involves no connection outside your computer to the internet or a local network. The IP address of the loopback network is 127.0.0.1, which you may have heard referred to under its domain name of 'http://localhost' i.e. the address of your computer. Loopback channel attacks can be used to flood your computer with TCP and/or UDP requests which can smash your IP stack or crash your computer. Leaving this box checked means the firewall filter traffic sent through this channel. communicate using the loopback channel. (Default = Enabled). Block Fragmented IP traffic - When a connection is opened between two computers, they must agree on a Maximum Transmission Unit (MTU). IP Datagram fragmentation occurs when data passes through a router with an MTU less than the MTU you are using i.e when a datagram is larger than the MTU of the network over which it must be sent, it is divided into smaller 'fragments' which are each sent separately. Fragmented IP packets can create threats similar to a DOS attack. Moreover, these fragmentations can double the amount of time it takes to send a single packet and slow down your download time (Default = Disabled). Do protocol Analysis - Protocol Analysis is key to the detection of fake packets used in denial of service attacks. Checking this option means Comodo Firewall checks every packet conforms to that protocols standards. If not, then the packets are blocked (Default = Disabled). Enable anti-ARP spoofing - A gratuitous Address Resolution Protocol (ARP) frame is an ARP Reply that is broadcast to all machines in a network and is not in response to any ARP Request. When an ARP Reply is broadcast, all hosts are required to update their local ARP caches, whether or not the ARP Reply was in response to an ARP Request they had issued. Gratuitous ARP frames are important as they update your machine's ARP cache whenever there is a change to another machine on the network (for example, if a network card is replaced in a machine on the network, then a gratuitous ARP frame informs your machine of this change and requests to update your ARP cache so that data can be correctly routed). However, while ARP calls might be relevant to an ever shifting office network comprising many machines that need to keep each other updated , it is of far less relevance to, say, a single computer in your home network. Enabling this setting helps to block such requests - protecting the ARP cache from potentially malicious updates (Default = Disabled).